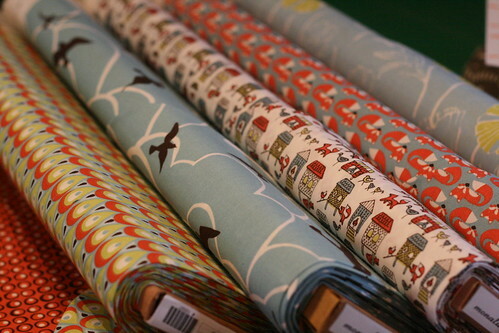 I'm really excited about the new organic prints from Monaluna's Anika and Marin lines. The two lines coordinate beautifully and I don't think any of it (but especially those foxes) is going to stick around here very long. Both the Woman and Child issues of Ottobre magazine are here (3/2011 for those keeping track). I took a good, long look at the children's issue and I'll be bringing one home with me. Even though it's a summer issue, there is a lot of beautiful, functional transitional clothing that your kids will want to wear all year long. You can preview all their patterns here. Have you thought about handmade for Father's Day? We'll be doing a boxer short pattern review tomorrow, and we also carry patterns for ties, pjs, and other apparel. Look through our Jalie patterns for inspiration, or check Stitch magazine-- they always has at least a couple of patterns per issue with men in mind!